TORONTO, ONTARIO–(Marketwired – Nov. 6, 2015) – Tellza Communications Inc. (TSX:TEL) announced its unaudited financial results for the three and nine months ended September 30th, 2015. Revenue for the nine months ended September 30th, 2015 was $213 Million USD compared to $196 Million USD in 2014. EBITDA* was $1.7 million USD compared to $2.1 million USD in 2014. While we conduct our business primarily in USD, our stock trades in CDN dollars. With the appreciation of the USD compared to the CDN dollar in 2015, EBITDA in CDN dollars is $2.2 million for the nine months ended September 30 compared to CDN dollars $2.4 million in 2014. The reduction in USD EBITDA is related to tighter margins in our core business, higher bad debts and ongoing start-up costs related to route dynamix, the Company’s SMS initiative. 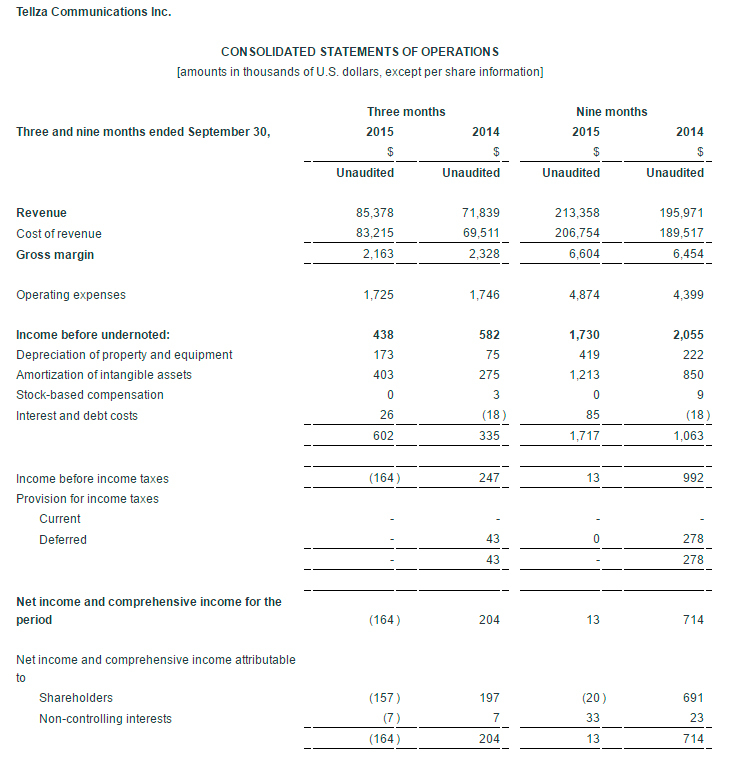 Net Income was $nil million USD compared to net income of $0.7 million USD in 2014. The decrease in Net Income is primarily related to increase in non-cash depreciation and amortization in 2015 of $1.6 million compared to $1.0 million in 2014; increase related to the 2014 acquisition of Matchcom and CAPEX related to development of our communications network and related systems. “We’re operating in the nearly free market for telephone calls. Our investment in systems has allowed us to remain profitable, while many of our competitors have commenced exiting the business. As the systems commodity matures, we expect to see sustained business with improved margins,” said Gary Clifford, Executive Chairman.